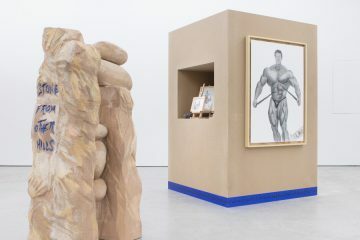 It is now about decade that Internet allowed cultural contents such as music, books and movies to circulate not through physical objects, but in the form of files, which are traded and consumed with computers and mobile devices. 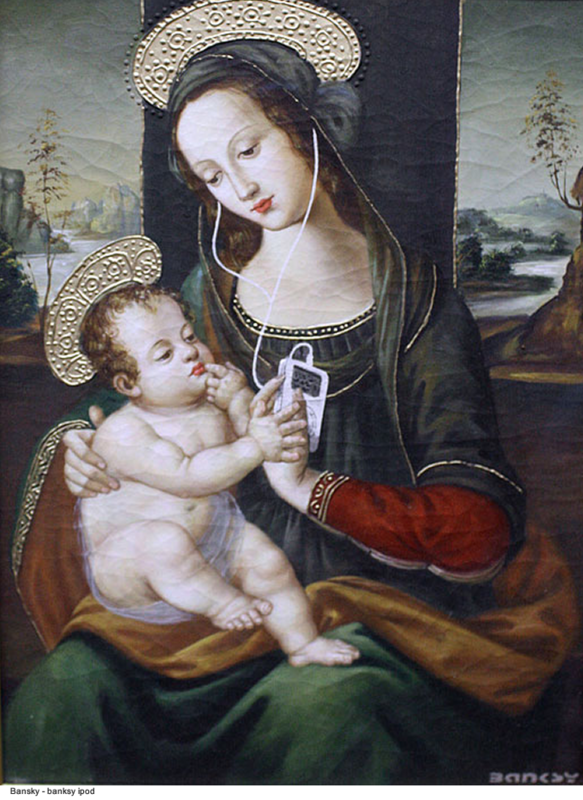 We can thus ask: where do we stand in 2014, especially in Italy, with the effective dissemination of digital cultural contents and the development of digital cultural markets, compared to the diffusion of traditional physical media? 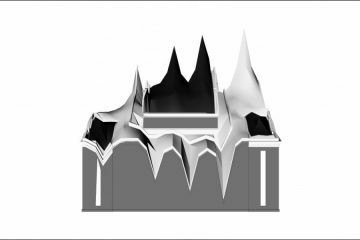 Which is the difference in the developing of digital cultural markets in Italy compared to other countries, and especially to the United States, which is for various reasons the landmark reference in this process? We will try to offer a summary portrait of the situation, considering some data coming from a recent sociological research (carried out by the University of Padova) on the digitalization of cultural production in Italy and regarding three specific sectors: digital music, books and newspapers. We can start with the sector of digital music. The market of digital music have become reality since 2003, with the birth of the first “virtual” music store, the Apple’s iTunes Store. Thanks to the successfulness of this platform and the iPod, already in 2008 in the U.S. music in mp3 format constituted about one-third of the total revenues coming from music sales; in 2011 digital music even surpassed physical media in overall sales. In comparison, in Italy the transformation of music market has developed much more slowly. In 2008, Italian digital music sales did not reach even 10% of the entire market, while the figures for 2013 say that digital music amounted to nearly one-third of the entire music sold: about half of the penetration of digital music in the U.S. (see Table 1). 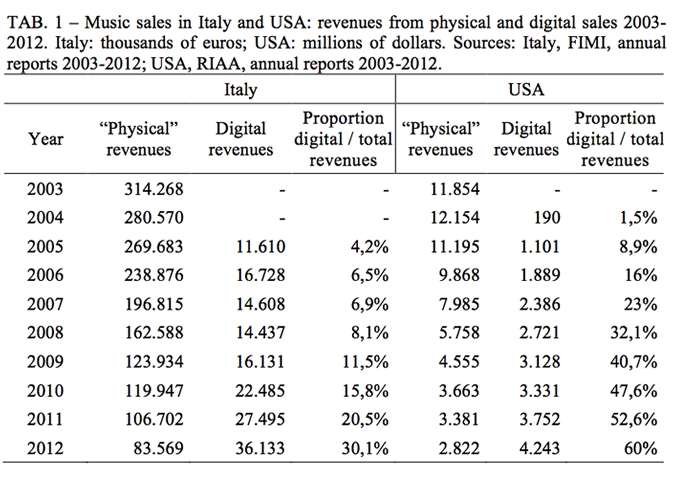 In short, these data show that in Italy digital music sales are at least 5 years behind those in the U.S market. This Italian delay has different reasons, involving both specific aspects relating to the Italian music market (much smaller and less dynamic firms than the U.S.), and broader issues, such as the overall Internet penetration in Italian households, the quality of Italian digital infrastructure and the scarce propensity of Italian consumers to shop online with a credit card (data from the Bank of Italy says that in 2012 credit card purchases in the country amounted to 8%, a figure well below average European statistics: about 20%). Another relevant sector in the digitalization of culture ids that of digital books. Also in this case the U.S. has anticipated the spread of this form of circulation of written novels and essays. In the United States ebook sales have grown from about 10 million in 2008 to 457 million in 2013, thus accounting last years for about 14% of the total revenues in the book industry (Data from BISG). 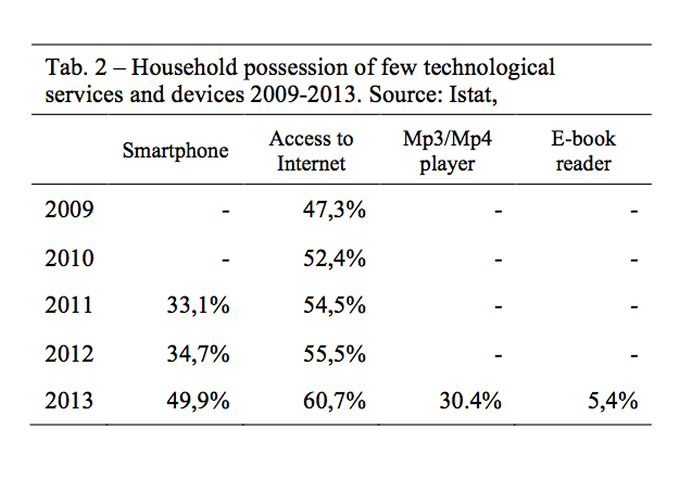 Compared to the U.S., in Italy the diffusion of ebooks remain still much marginal. According to the AIE, the Italian Publishers Association, in 2011 books sold in digital format in our country have been 1.1% of all book sales (567,000), to become 1.8% (925,000) in 2012 and still provisional data from 2013 show only a very slight increment. On this difference a variety of factors play a role and especially the rate of penetration of digital portable devices able to read ebooks: while in 2013 the U.S. owners of portable devices capable of reading ebooks were 30.6%, in Italy (according to ISTAT) the holders of these devices were only 5.4% (see TAB 2). A sector where the consequences of digitization are particularly fresh is that of magazines and newspapers. Indeed, 2013 represented a particularly significant year for the digitization of Italian newspapers (facing in general with a radical crisis of the sector). During 12 months, sales of digital newspaper subscriptions have more than doubled, going from about 210,000 monthly average subscriptions in January 2013 to 450,000 s in January 2014 (see Table 3). 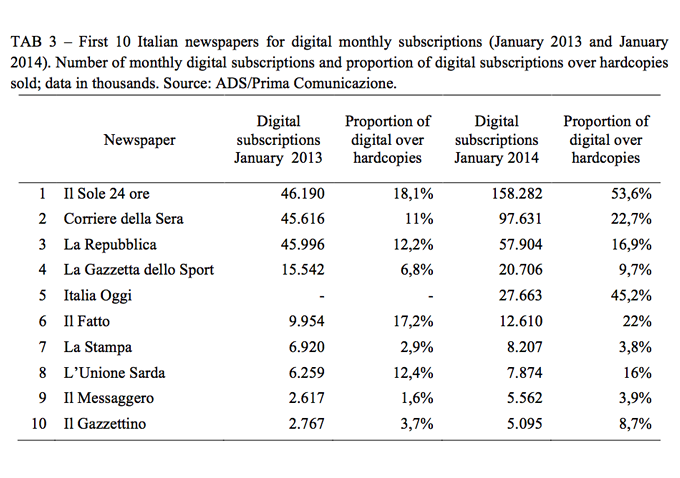 The diffusion of digital versions of Italian newspapers is very varied among the different kind of journals: at the beginning of 2014, some specialized newspapers (as the Sole 24 Ore and Italia Oggi) recorded half of their ‘copies’ sold through digital subscriptions; other wide-audience newspapers, which have hugely invested in the promotion of their digital versions (like Corrirere della Sera, La Repubblica and Il Fatto), reached a digital proportion of about 20%, while many others newspapers have still see their digital sales to take off (See TAB 3). 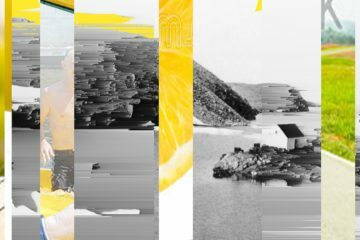 This data set regarding leading digital cultural markets allow for some more general considerations about the process of digitalization of culture in Italy. Firstly, Italy shows very clearly a delay in relation to the USA (and also to other European countries). In one of the main sectors, the music, this delay can be quantified in the terms of a rate of transition to the digital almost halved compared to U.S. Secondly, the rate of the digitization of culture seems depending crucially on the degree of ‘localization’ of cultural products considered. Although the available data are still referring to a very short period, the Italian book industry, almost disconnected from global players, seems to accuse a more pronounced slowness to embrace digital books as a solution to face the structural crisis affecting the sector. 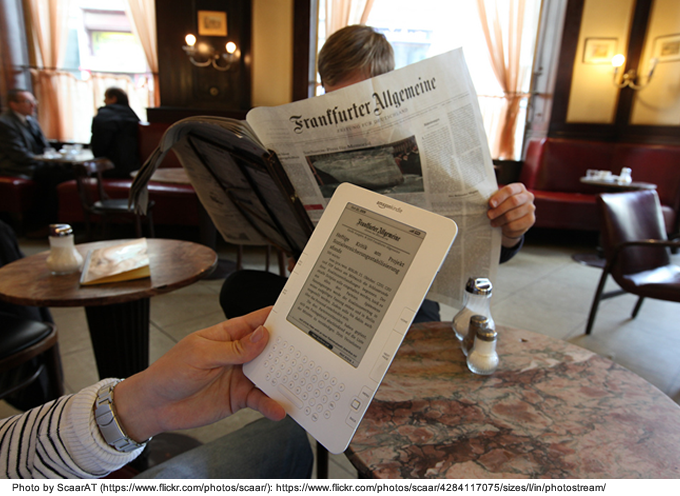 Finally, the sector of news and journalism, while started more recently, seems to have land off in new directions, especially thanks to the spread of new reading devices, such as the iPad and other tablets (thus intersecting its fate with that of the consumer electronic industry). 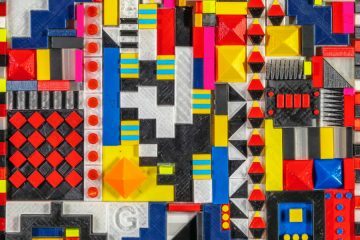 While these market data allow us to picture a general overview on the digitalization of cultural products, we also can recognize many implications in cultural, aesthetic and social terms: on these other dimensions we will come back with next articles for Digicult.